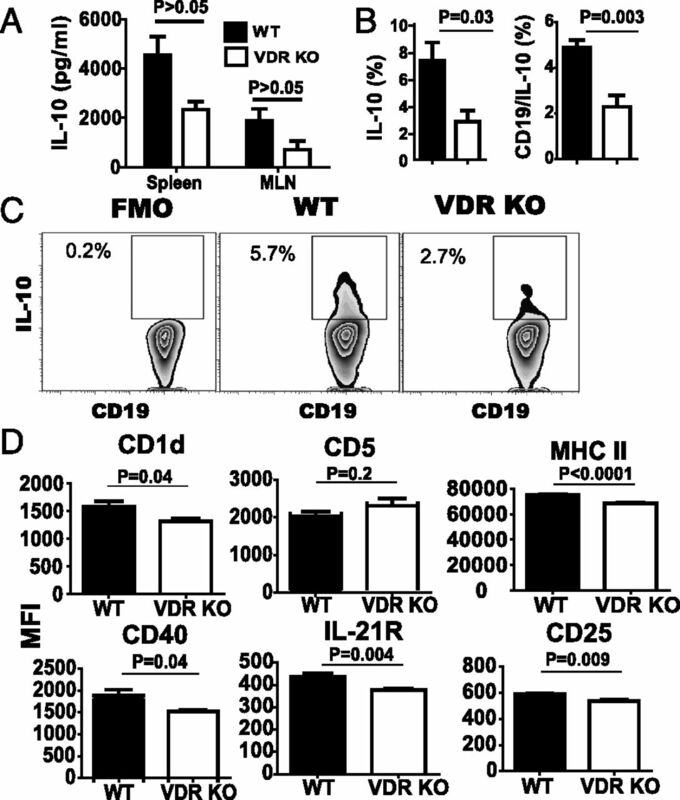 OVA-specific IgE responses in VDR KO mice. (A) Total serum IgE in WT and VDR KO mice. OVA-specific (B) IgG1, (C) IgG2c, and (D) IgE in the serum of WT and VDR KO mice. Values are the mean ± SEM from (A) n = 8–10 mice or (B–D) n = 4 mice per group and one representative of two independent experiments. Two-way ANOVAs with Bonferroni post hoc tests, *p < 0.05, ***p < 0.001 compared with WT controls. Vitamin D-deficient mice overproduce OVA-IgE. (A) Serum 25(OH)D, (B) total IgE levels in D+/D− Cyp KO and WT mice, and (C) OVA-specific IgE levels in D+ and D− mice of both genotypes (Cyp KO and WT). Values are the mean ± SEM from (A) n = 6–14 and (B and C) n = 6–11 mice per group and two independent experiments. (A) Student t test and two-way ANOVA with (B) Bonferroni post hoc test or (C) Tukey post hoc test, *p < 0.05, **p < 0.01. 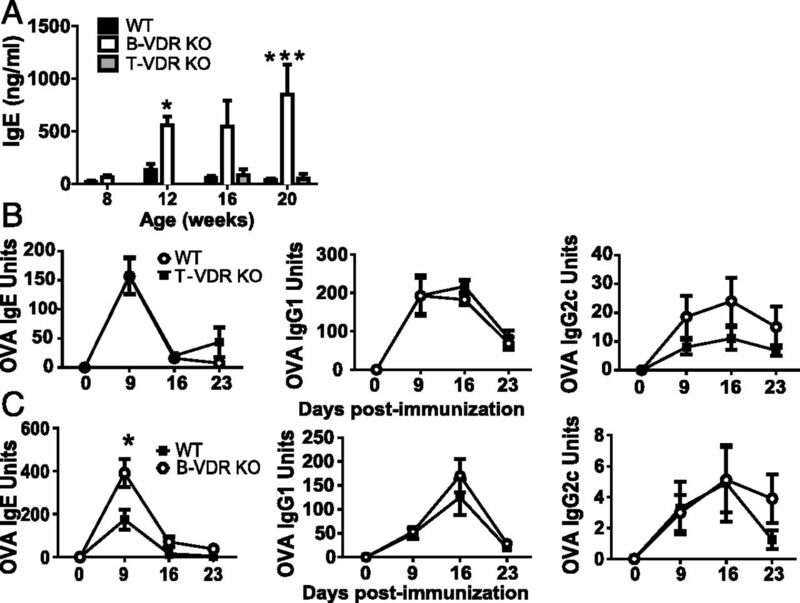 B cell– but not T cell–specific KO of the VDR results in IgE overproduction. (A) Total serum IgE levels, or OVA-IgE responses in (B) T-VDRKO and (C) B-VDR KO mice and their respective WT littermates. Values are the mean ± SEM from two independent experiments and n = 8–11 per group (A) and n = 6–8 per group (B and C). Two-way ANOVA with Bonferroni posttests. *p < 0.05, ***p < 0.0001. 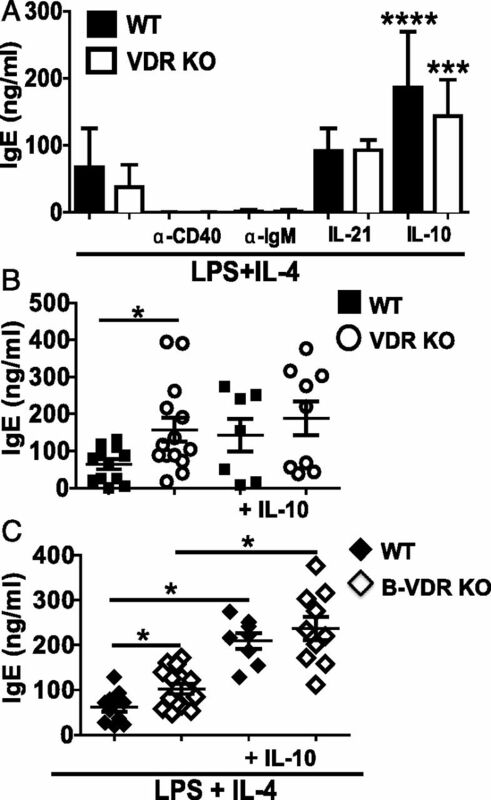 Reduced expression of B10 markers and less IL-10 in VDR KO mice. WT and VDR KO splenocytes were collected at day 9 postimmunization and restimulated in vitro for IL-10 production. (A) IL-10 production from splenocytes and MLNs stimulated with OVA in vitro at day 9 postimmunization. (B) Mean frequencies of IL-10–secreting cells and B10 cells (CD19/IL-10+). (C) CD19+ B cells and the florescence minus one (FMO, left) or IL10-producing B cells from day 9 OVA immunized WT and VDR KO splenocytes. (D) Mean fluorescence intensities (MFI) of CD1d, CD5, MHCII, CD40, IL-21R, and CD25 on B10 cells from WT and VDR KO mice. Values are the mean ± SEM of (A and B) n = 8 or (D) n = 7 mice per group and two independent experiments. Two-tailed Student t tests. *p < 0.05 compared with WT controls. IL-10 inhibits in vitro IgE production. Mice were immunized with OVA and alum for 9 d. All in vitro cultures (A–C) were for 5 d and included LPS plus IL-4 with additional stimuli as noted. In vitro IgE production from (A) purified WT and VDR KO B cells or MLN cultures from (B) VDR KO or (C) B-VDR KO and their respective WT controls. Values are the mean ± SEM from two independent experiments that used a total of n = 7 (A) or n = 8 (B and C) mice per group. Statistical comparisons in (A) are with additional treatment versus LPS plus IL-4 alone. One-way ANOVAs with Tukey posttest, *p < 0.05, ***p < 0.001. The additive effect of the microbiota on hyper IgE in VDR KO mice. Total serum levels of (A) IgE in age-matched CNV and GF WT mice. (B) Serum IgE levels in 8-wk old WT and VDR KO mice given Abx in drinking water for 2 and 4 wk. (C) Serum IgE levels in WT and VDR KO mice after 4 wk of Abx compared with age-matched CNV controls. (D) Serum IgE after the transfer of WT or VDR KO cecal contents into 6-wk old GF mice. Values in (A) are the mean ± SEM of n = 5–8 mice per group, two-tailed Student t tests. Values in (B) and (C) are the mean ± SEM from n = 8–10 mice per group and two independent experiments. Values in (D) are the mean ± SEM of n = 3–5 mice per group. Two-way ANOVA with Bonferroni posttest (B and D) and one-way ANOVA with Tukey posttest (C). *p < 0.05, ***p < 0.001, ****p < 0.0001. Values are the mean ± SEM of frequencies from six to eight individual mice per group. ↵a CD19+ B cell frequencies. ↵b Two-tailed Student t tests, *p < 0.05 compared with VDR KO values. ↵c Frequencies of the follicular, marginal zone, B1, and B2 populations within the CD19+ B cells in the spleen.